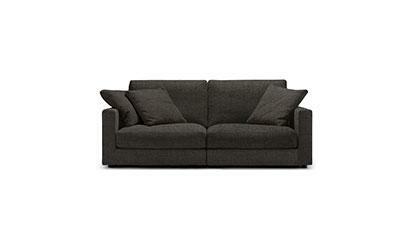 The Morris modern sofa is available in standard dimensions or can be custom made according to your needs. Shop on-line or in one of our showrooms, our furniture consultants are ready to assist you. Wood frame with interwoven elastic belts, covered with non-deformable polyurethane foam and polyester fibre. Seat cushion in non-deformable polyurethane foam with top layer in goose feather. Back cushions filled with piumafill: 70% natural feather + 30% polyester fibre. Optional virgin goose down filled cushion. This model is available in fabric or leather. The fabric version has removable cover, in leather version only the cushions have removable cover. N°1 scatter cushion is included per seat. A team of professionals makes the Morris modern sofa.